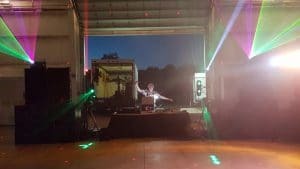 DJ Bob Hughes will make your wedding reception, high school reunion, anniversary party or special event shine and be the success you’ll never forget. With over 20 years of mobile DJ and broadcast experience here in Michigan (not to mention Phoenix, AZ. ), Bob is the logical choice for you! For 25 years Bob entertained you as the Mid-day Host on WHNN and he has brought his extraordinary talent and musical knowledge to over 500 wedding receptions and parties along the way. Excellent sound and lighting, attention to detail, plus great personality….it all adds up to a winning choice for you! Rusch Entertainment Featured Bob Hughes for a Huge Frankenmuth Festival! Looking for something a little different? Need to personalize your Holiday party? 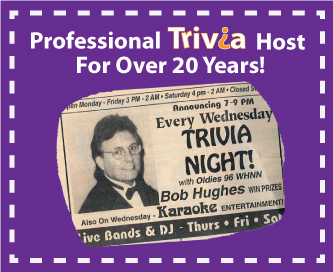 Bob can write special trivia that will pertain to your company event for tons of FUN before the dancing begins! Bob was amazing. Even though things came up and didn’t go as we talked he never missed a beat. He was just amazing and my sister is getting married next August and actually wants bob to do her wedding..keep up the great job you do bob you made the wedding reception happen. Thank you Bob did a great job we all had a great time!!! Thank you for all your help with making our wedding extremely special. We had a wonderful time. Bob was extremely kind and as helpful as possible. It was great. DJ Bob Hughes did a great job. Was a fun night . Very professional at the Saints Snowmobile Club, St Charles. Bob couldn’t have done more to make our night more memorable. Our guest were impressed with the selection of music. In fact one comment was “It was the best reception they’ve been to.” We cant thank bob enough! Thank you so much for the wonderful job you did at our wedding reception on August 17th. You made the evening so enjoyable, thanks! You did such a wonderful job at our wedding reception! The music selections were wonderful and everything went very smoothly. You made our night even more memorable and special! Thank you!! Bob was very likeable. He did a nice job of keeping things flowing. It turned out just how I wanted it. Couldn’t have been better. Everything we wanted. Bob did an excellent job, everyone that I talked to thought the same. He was very professional, had a good voice, set up perfect he was very fun. We are very glad we choose your company! Thanks for helping us have the perfect reception. Everything was great! Bob kept us on target as good as he could. Thank you very much!! Myself and my family are very impressed and happy with the DJ. There was zero complaints. I don’t feel that anything should have been different THANK YOU!! Bob helped make my parents party a success. Thank you for taking good care of us once again. Because of you, our 2000 GM powertrain Christmas Party at the Bavarian Inn Lodge was a great success. We really do appreciate the find job you do for us. We look forward to seeing you back with us again next year. We wish you well in your new venture. A Blessed Christmas and a Happy New Year to you and your family! He did a great job. I know a lot of people didn’t do a lot of dancing, but a lot of visiting and enjoying the music. There was a mixed crowd and he pleased them all! Thank you again!